SIA :: STRATEGY INTO ACTION - Training House Consulting (Pvt.) Ltd.
Over three-quarters of companies around the world set out clear strategic plans, but nearly half admit that they are bad at putting them into action. We are here to Translate Strategy into Action. We do this for both your strategy and ours. If accomplish this, then we both win. Training House is based on the idea of a fair deal. Our topmost goal is to Create Value. Again, we do this for both you and us. One of our most unique attributes is our ability to Build a Strong Methodology. Every day, there seems to be a “silver bullet” intended to solve all your management problems. Although there are some interesting concepts, there is no “silver bullet.” We understand that the solution to every situation is different. We bring a mix of the best ideas available and simplify them down to the essential, value-adding concepts. We also have to Nurture the Relationships that we have entered in to. Our job is to work with you for a long time, because we know that it takes time for strategy to mature. Translating strategy into action does not happen overnight. To do this, we need to Develop Our Team. We must build our capacity so that each professional has our unique skills and mindset. We also have to Create One View, which is all about our shared mindset and culture. Our view is about professionalism, creativity, excellence, and ultimately, producing a business that endures. 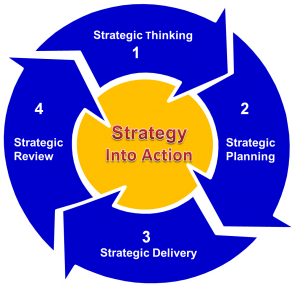 SIA (Strategy into Action) is one such tool that provides architecture and an opportunity to explore and address key issues. Training-House Consulting starts with expanding the vision of what’s possible with the business and then plans backward to determine the necessary first steps to start the journey. We also look at the empowering beliefs you need to have in place to improve your opportunities for success through the “Kaizen” process of execution. SIA will definitely help your company to move ahead with a clear strategic direction in a more focused and deliberate manner. Our SIA implementation will give you an opportunity to explore the beliefs, motivation, and direction of your own team as effective leaders to get on with making your companies vision a reality. Working closely with the functional heads, we draw on all the information provided and help the team to reflect back an image of what they see as the strategic direction. It then also enables us to adjust and fine-tune that vision into something that is both appealing and actionable in the shape of “must win battles”. After consolidation of all the information it becomes a lot easier to decide where to focus our efforts. Multiple strategies by all functions are then deliberated within larger functional groups to device key action steps and KPIs for sharing with rest of the members. The Final Plan appears in the shape of a scoreboard, reviewed monthly to mark red, green or amber light signals to take corrective measures. Monthly review of strategic planning will start delivering concrete results and will also bring about the emergence of new projects, a development that is part of a successful strategy. All team members will also start taking actions based on the non-achievement of certain milestones where accountability factor will set-in. The ultimate aim of this process is to ensure that all functions/stakeholders that are part of the vision are committed and work cohesively towards a common goal. SIA will act as a binding force and a change catalyst within your organisation that will in return deliver higher results.